The towel on the left has 2/16 linen in a soft steel grey. There are two of these. Here they are all pressed and drafts in protective sleeves... all ready to mail away. I'm really looking forward to getting the return parcel next month! The day before yesterday my local community held the annual 'Fleece and Fibre' Fair and I was there bright and early. Lots to see and do and shopping of course. I found some cones of 5/2 pearl cotton in a sale box and got a great deal on the six cones / six pounds in three colours. ( three of the lavender, two of the green and the one soft pink) That's one area of my stash that was a bit light for selection so this was a nice find. The seller said it was mill ends from a textile mill in Georgia that closed down. 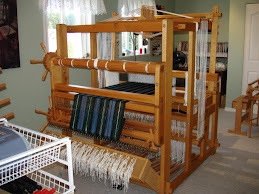 I have a quiet few days planned in the studio and will tidy up loose ends and get a warp on the new loom. Tonight, we're off for our anniversary dinner. Where did 23 years go? Time flies when you are having fun. I realized just the other day that I had yet to show you the final finished runners! I had hand sewed the hems while away and wet finished them once we got home, but life has been quite hectic since then (when isn't it?) This pattern seemed to get some favourable remarks when I had originally posted so I thought I would do a review. I received this pattern some years ago from a friend, though since then I understand something similar appeared in a Handwoven. I have searched what issues I have and no luck! I'm big on giving credit when due. Here is the cloth off loom and relaxed. Quite a difference isn't it? From there the 2 runners and 2 tray cloths went to the serger to secure the edges. I am very pleased with how well serging secures the raw edges of hand wovens and use this for all hemmed items. The serger is just an inexpensive model and I don't use it for anything else...but it's confidence builder for when you are selling your goods and you want them to last long after they leave your hands. I am going to try and set the draft up in my Fiberworks program for you and edit it back into here when I do. I'm new to importing a 'capture' so bear with me. I started once more into assembling the new Louet Spring loom. The instructions call for tie up cords to be done later when the front and back beam are in place but since my arthritis doesn't like being crouched and bent like that, I decided to add the tie cords now over later. I had cords to do half the possible placements from Louet, some additional cord I had bought and my old tie up cords from the Woolhouse loom. I have managed to get a cord in place for all but approx 20 upper lamm spots and I'll get those filled in time with more cord when I can. I don't want to have to move tie cords if I can help it and this way it makes a tie up faster for me. I got the back beam on and secure next. Not difficult and although I could have used a second pair of hands at one point, I managed it by myself. Then I assembled the treadles (I had already added the screws while comfortably seated the day before!) Flipped it over and attached the foot beam to the sides. The left middle side beam is next. It would have gone on sooner but the instruction notes gave confusing information about the size of the cloth beam holes and which side they were placed on. Turns out I had it right. Yesterday, I attached the brake assembly, cut some non-skid matting for the tool/ accessory tray on the castle, slipped the upper lamm cords down through their proper placements and then slid my bench up to the front to check the height. It's right just where it is! I must wind a warp *soon* and plan a 'get to know you' warp of kitchen towels, and I'm thinking a plaited twill. But I have a weaving commitment going on my other loom that has a deadline clock ticking! I like to give my looms names but I'm stuck this time round. I have a feeling she'll just be known as Spring. Years ago I went searching for smaller cushions or pillows to use on my benches. I found two pillows, both the same, and bought them. Back then I had no idea of how prophetic they would be someday. So this last picture is of the bench pillow I will be using.... and since my friend Lynnette and I bought Spring looms together at the same time, I took her my second pillow to her as a gift when we were there last month so she can 'dance' as well. Something to be Truly Thankful For! The Canadian Thanksgiving weekend is almost here and look what arrived on my door step this morning! There was just the two boxes: this large one with nifty lifting handles and another smaller box which is just behind. Together they are not overly heavy and we brought them inside. Our little dog Connor was checking things out too. He loves to help unwrap things. It held a lot of the smaller parts and bags of nut, bolts, screws and even all the tools to put the loom together. Literally all we will need is a small mallet at some point for gentle 'tapping'. The second box (complete with wood end pieces for strength!) held some of the heavier long pieces as the breast beam and the cloth and warp beams, lease sticks, warping sticks. I have *never* seen anything so well wrapped and packaged. My husband commented several time about how well it is organised. The tools provided are not cheap throw aways either. Now, this section of the castle below is what I saw first as I pulled on the loom as my husband pushed. I must say that I panicked! I thought it was some horrible mistake! A quick call to Jane Stafford and our finally finding the assembly guide, I came to realize that these parts are temporary for shipping and the proper parts are placed later. (phew!) I think Jane is still chuckling over that call! So I have unwrapped everything and placed all the treadle screws and snipped all the tops and bottoms of my heddles. Tomorrow I start the assembly process in earnest! My husband Bruce had a bad moment the day before yesterday and he was taken to the hospital. We had a few worrying 12 hours hours while he was thoroughly checked out but after a stress test yesterday, it's *not* his heart. It might be something simple like his inner ear and balance.... or possibly something a bit more. We'll find out more in the coming days. He has never waivered in his support of my weaving over the years and I call him my 'Patron of the Arts'. This weekend when we all take stock of what we have to be thankful for....he will come to my mind first.